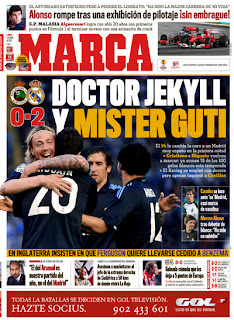 Real Madrid: Dr. Jekyll & Mr. Guti: The #14 changes the complexion of a turgid Madrid in the first half. Cristiano and Higuain continue to score, they now make-up 51 of the the 100 goals the whites have scored this season. Racing came out strong but hardly bothered Casillas. Canales shone in front of his Madrid who almost scored a vasilina goal. Marcos Alonso: after debuting in white, It hs been uplifting. England: the papers insist that Ferguson wants to sign Benzema on loan (to Manchester United). Barcelona: Guardiola: heals himself: Arsenal is our match of the year, not Madrid. World Cup: an attack on World Cup security: The leader of the extreme right party is assassinated by a machete attack in South Africa, 50 kilometers from where La Roja (Spain) will live. Atletico Madrid 3-0 Deportivo: a comfortable goleada that leaves them 5 points from Europe. Forlan reconciles with the Calderon faithful. Results: Valladolid 0-2 Villareal, Sporting 2-2 Xerez, Getafe 1-1 Espanyol, Almeria 1-1 Mallorca, Valencia 3-0 Osasuna. Reaction: I still dont understand what the big deal is with Guti. He cant run, wont run in fact, cant be bothered to train most days, misses games on end when needed and then bothers to show up half-way into the match and pulls off a sublime piece of skill and timing like the Higuain goal. Whats his purpose then if he cant be consistent? 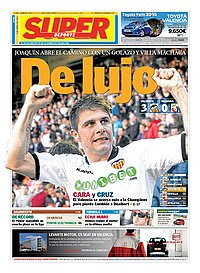 SuperDeporte.esValencia 3-0 Osasuna: Joaquin opens the scoring with a wonder goal and Villa crushes one. David Villa, the best striker at home, the Valencia gunner has scored 14 goals at Mestalla this term; Messi and Higuain dont score this much at home. Emery: We look for reasons for the injuries. Villareal: Ibagaza, This victory gives us tranquility, the yellows fooyballer assures us that he is confident in his game, and that shows on the pitch. Real Madrid: Racing cannot cope with the finishing of los merengues. In a weak game, Cristiano Ronaldo and Higuain permit Madrids leadership in the league before next Saturdays match. Results: Valladolid 0-2 Villareal, Sporting 2-2 Xerez, Getafe 1-1 Espanyol, Almeria 1-1 Mallorca, Valencia 3-0 Osasuna. Reaction: I tried this experiment, using Valencias Super Deporte instead of one of As.coms cover, or either one of the Barcelona covers, but frankly, its a mess and Im sorry. There is very little copy to run with and I had to get a smattering of info from the website and become essentially their cover editor, so there. No more super Deporte until they can put together a better cover. Nice goal by Joaquin though as Valencia finally came ot of their shell yesterday.